I went to Stephanie’s The Hair Care Company about 6 months ago. 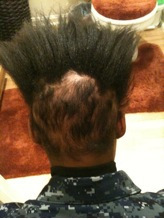 I told her I was having problems; alopecia had taken over my scalp. My morale was really low, and I had lost all of my confidence. I didn’t know if she could help me because all I could think about was the fact that I have tried everything else. Stephanie was my last resort for gaining my confidence again. The first thing Stephanie did was inform me of everything I needed to know forward and honestly. “I believe I can help you, but you’ll receive better results if you come to me weekly vs. bi-weekly,” she told me. 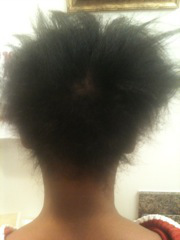 She also advised me to cease using chemicals, such as relaxers, perms, etc. Going natural was a difficult step to take, but I was willing to do whatever she needed me to do; and so the journey began. My initial care began with The Scalp Exfoliation Treatment. Stephanie told me it would rid my hair of all foreign particles, dust, and dirt that would hinder hair growth. The treatment was a combination of the Dead Sea Scalp Mask and Sugar Scalp Scrub, two of The Hair Care Company’s original products. Such natural products were all a surprise to me, but every experience felt as if I were getting a massage. I enjoyed every moment of the assistant’s shampoo. It was like she knew exactly where to scratch. After the first two weeks, I had already begun to see results. I was still a little skeptical about how my ending results were going to turn out, but The Follicle Rejuvenating System had already begun to show vast improvements on my scalp. Every week that I came back and saw how the treatments were working, was another week I would hear Stephanie cheering me on. She was a motivator through the entire process. Soon, I started to feel better about my looks and ultimately about myself. By the time Thanksgiving started to roll around, I had already had about six treatments of The Follicle Rejuvenating System. This product was actually giving me my hair back. For the first time, I was seeing consistent results. Stephanie was proud of her product, and so was I. Stephanie’s coworkers were commenting to her and to me on how well the treatment was taking to my scalp. Because of the distance from my home to The Hair Care Company, I wanted to continue my treatments at home. So, I asked Stephanie if I could purchase the products and continue my treatment at home. She told me as long as I continued the treatment, she believed the product would continue working as it had been. I bought the entire system and continued my weekly treatments. 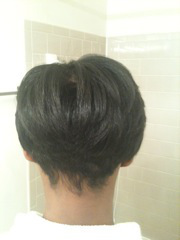 My hair was starting to fill in. I was so excited that prayers were being answered. 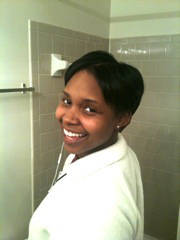 I was getting my hair back. This was a bit of a process, but I didn’t mind at all; the ending reward was much greater. For once in a long time, I was starting to feel like myself again. I had the help of my mother and my husband, and equally as important, Stephanie and The Hair Care Company. 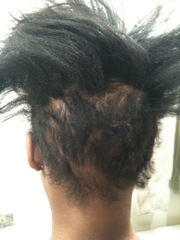 Alopecia has been a chronic problem for me, but because of Stephanie’s help, I have been able to overcome it. She is truly a blessing. I failed to mention throughout this testimony that I now have a wonderful, talented hairstylist (among her fellow wonderful and talented coworkers). I am still a client at The Hair Care Company continuing my treatments and to top it off, I haven’t used chemicals in my hair in six months! A lot of black women believe this is a hard thing to do; but I’m here to say to those women, it’s a great experience. The majority of customers at The Hair Care Company have been advised to or decided on their own to “go natural.” Stephanie and her team have the talent to make natural hair look like it has been processed. The best thing about being natural though is that your hair has less of a tendency to become damaged, it becomes stronger. As a desperate 24-year-old young woman looking to regain her confidence, and hair back, I found Stephanie just looking on the internet. I didn’t know what to expect, but I saw that she specialized in many different hair problems. After emailing her, I felt like it was worth a try. I am so glad I found Stephanie and The Hair Care Company. My entire process has been a very positive experience. Not one time did the treatments show anything less than positive results. If I had to make a suggestion to anyone that is going through the same thing that I have gone through, I would lead them straight to Stephanie and The Hair Care Company! FOR MORE INFORMATION AND TO PURCHASE THIS SYSTEM CLICK HERE!